2010 reissue, originally released in 1980. Reissue of Benders second LP from 1981, recreating (slightly less elaborately) the originals plaster sealed sleeve. 2010 reissue, originally released in 1983. "Absolutely winning, home-brewed experimental electronic pop, presented in impeccable, homemade fashion!References: Ike Yard, Food and Shelter, Men/Eject, Charles De Goal, Nurse With Wound, United Dairies, Pinakotheca, Vanity Records." - Mutant Sounds. 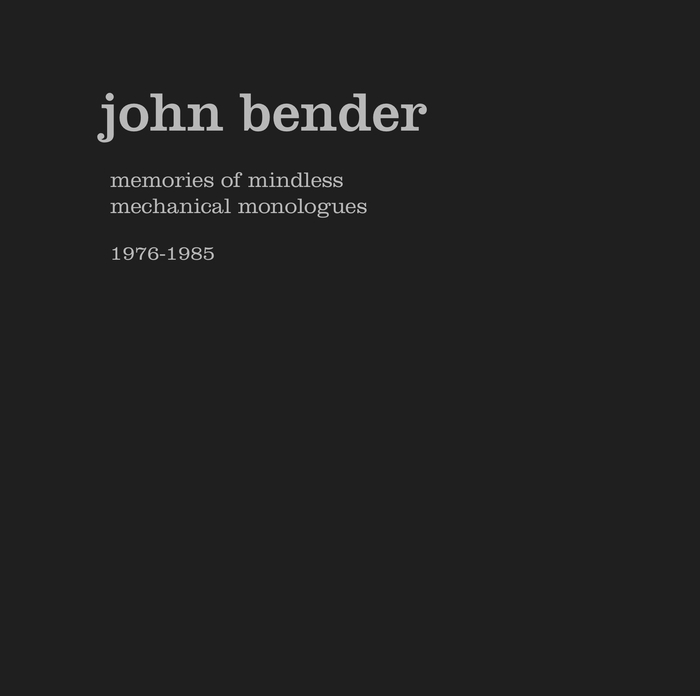 "John Bender recorded voraciously between 1978 and 1980 at his home in Cincinnati, Ohio. Not even song titles could slow down his creative pace, as he named all the tracks after their position on the original tapes. 36A2, for example, was cassette #36 side A, piece #2. To close the DIY aesthetic circle, Bender made sleeves by hand with no two covers alike and pressed the LPs in hyper-limited editions on his own Record Sluts imprint. I Dont Remember Now/I Dont Want To Talk About It, Benders first album from 1980, is the holy grail of minimal lo-fi electronics. Layers of fractured melodies, distorted synthesizers, hollowed-out rhythms and claustrophobic vocals unfold over the 40 minutes of this lost masterpiece. Its A Rainy Day, Sunshine Girl, one of Fausts greatest songs, is perfectly deconstructed by a distinct punk-meets-experimentalist sensibility. While I Dont Remember Now is impossibly rare and the man behind the music remains shrouded in self-imposed mystery, the real surprise is that it has taken 35+ years for listeners to discover Benders warm, art-damaged immediacy. This first-time standalone reissue is recommended for fans of Pere Ubu, Brian Eno and Robert Ashley. Limited to 1,000 numbered copies. Red vinyl with hand-stamped jackets, each one unique. Liner notes by John Bender." - Superior Viaduct. "Plaster Falling was recorded at the same time as John Benders first album, I Dont Remember Now / I Dont Want To Talk About It. Released in 1981 on the artists own Record Sluts label, copies of Plaster Fallings initial pressing came hermetically sealed in plaster (and later latex). Thus, listeners had to literally break open the record to find whats hidden inside. Produced in relative isolation, Plaster Falling is a beacon of brilliance in the nascent minimal-wave sphere. Veering towards skeletal urgency, these recordings set bright analog melodies against half-whispered vocals and expand Benders electronic cryptography thru a series of lone signifiers: Station, Plaster, Women, etc. As Bender explains in the liner notes, I began to distance myself from the present and describe scenes as if in a movie -- seeking concrete, terse, juxtaposed imagery. This first-time standalone reissue is recommended for fans of Gareth Williams & Mary Curries Flaming Tunes, Minimal Man and Grouper. Pressed on translucent blue vinyl in a limited / numbered edition of 1,000 copies." - Superior Viaduct. "Following the release of lo-fi electronic masterpiece I Dont Remember Now / I Dont Want To Talk About It (1980) and his brilliant follow-up Plaster Falling (1981), Cincinnati-based artist John Bender began assembling his third and last album, Pop Surgery, in late 1982. While all of Benders work draws from intimate home recordings - featuring the artist alone with various keyboards, analogue sequencers and tape delays - Pop Surgery remains the one that perhaps best distills his arrant deconstruction of the pop concept. These twelve frenetic tracks, meticulously stitched together with dubbed-out vocals and disjointed drum machines, stretch the boundaries of bedroom electronics. Bender would forgo the handmade LP sleeves typical of his Record Sluts imprint. The cover depicts an imposing scrapyard crane, ready to pick up discarded objects with its bright red electromagnet, while the center labels détourn Columbias classic 1970s style. I pressed a single run of 500 copies, Bender recounts. The only review I remember railed at the poor production quality. The DIY era had clearly come to an end. This first-time standalone reissue is recommended for fans of Suicide, TGs 20 Jazz Funk Greats (1979) and early Cabaret Voltaire. Liner notes by John Bender." - Superior Viaduct. Format: 7 LP + 7"
“2015 repress of the 2012 box set. John Bender is without a doubt the protagonist, if not the inventor, of the musical genre known as minimal wave. His synthesizer sounds carried elements of techno and acid a decade before the invention of techno. His voice and his somewhat sentimental, mournful lyrics made his music outstanding and extraordinary, an unprecedented mixture of elements. His three self-released LPs -- I Dont Remember Now (1980),Plaster Falling (1981), and Pop Surgery (1983) -- are must-haves for every serious collector and anyone interested in coldwave, minimal synth, and techno sounds. This seven-LP box set (with bonus 7") includes I Dont Remember Now, Plaster Falling (with selections from several tape releases known as Plaster: The Prototypes (1981)), Pop Surgery (also with selections from Plaster: The Prototypes), Packing List (1982), At the 4th St. Cage 1/83 (1983), Do the Cage (1983), and tracks from The Cassette (1986), originally released under Benders Johnny Vortex moniker.” - Vinyl-on-Demand.